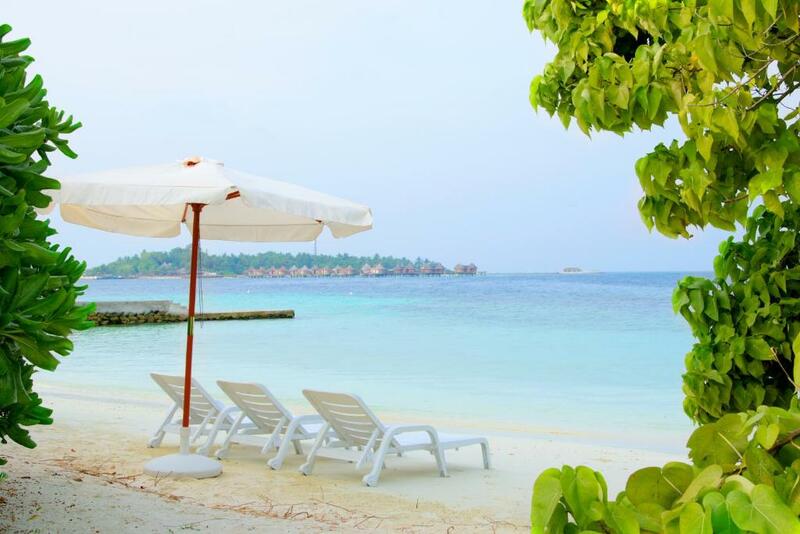 A great option for a a fun-filled budget holiday in the Maldives, Bodufolhudhoo is a small island in the North Ari Atol. The beautiful island is well known for its spectacular marine life with a beautiful house reef ideal for snorkeling and is surrounded by a some famous resorts including Nika Island Resort, Velidoo and Gangehi. The name of the island translates as "great folhudhoo" and next, ironically, is the smaller island of Kudafolhudhoo "little folhudhoo". The first guest house on the island was opened only in 2015, the islanders are very friendly and lways open to tourism. Today, apart from the guest houses there are 2 local cafes, a large children's playground, and a dive shcool PADI and water sports center on Bodufolhudhoo. Tourism in Bodufolhudhoo is still in its early stages however the island's beauty, culture and coral reefs remain largely untouched. The community is small, friendly, open and respects foreigners and treats them like its guests. The tiny size of the island and the hospitality of the islanders allows you to enjoy a calm and full Maldives experience. As the place is relatively far from Male airport, the local, rural atmosphere of the Maldivian way of life is perfectly preserved here. 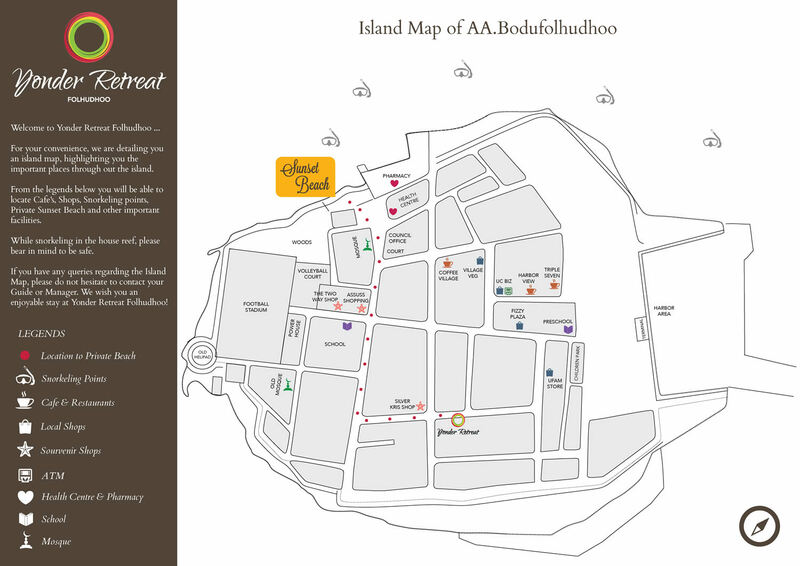 Bodufolhudhoo has a hospital, 2 cafes, several shops, including souvenirs, two mosques, a school and a football field. There are two main ways to get to the island. The first and cheapest is a public ferry. This option is only 3 US dollars for costs, but this transfer is incredibly slow - the journey time is about 5 hours 30 min. In a week there are three ferries from Male - on Sundays, Tuesdays and Thursdays. The boat leaves Villingilly terminal at 9 am. The return from Bodufolhudhoo is simultaneously on Mondays, Wednesdays and Saturdays. If it's a beautiful day, and you easily endure sea sickness, and you have a limited budget - then I would advise using this transfer. 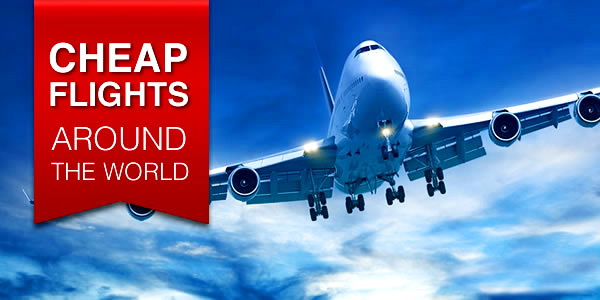 Of course, there is a possibility to book a seaplane to the nearest resort, but this trip will costs more than $ 260 one way + extra boat to the island. You can rent also a private boat from Male if you are traveling in a large group (about $ 600 for 8 people in each direction, available 24 Hours), but these methods are less common. After breakfast, it's time to head straight to the bikini beach that is just a short walk away. 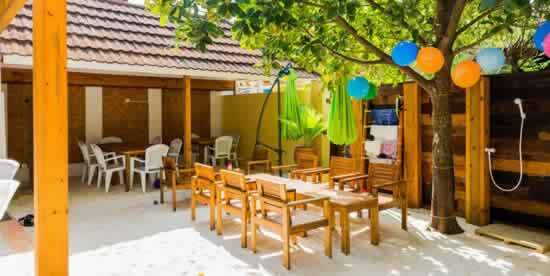 Each guest house provides its guests with beach towels and on the beach there are sun loungers. Expect to see on white sands a dozen other guests relazing under the shadow trees or sunbathing. Although tourists can wear bikinis here, modest clothes are recommended (for men and women) - local islands adhere to pretty strict dress codes and, although they are open to foreign travelers, I always emphasize that you should be respectful that swings clothes. Remember, local tourism in Bodufolhudhoo Island is still very new, and many islanders are not yet accustomed to open bodies, so a little respect goes a long way. If you do not want to cover a little on the streets of the island, I would even say that you'd better stay at the resort. From a practical point of view, I suggest a method from the shoulder to the knees for both men and women. In a backpack it is always desirable to have a sarong, shorts and a T-shirt - simply and tastefully! Now about the beach. 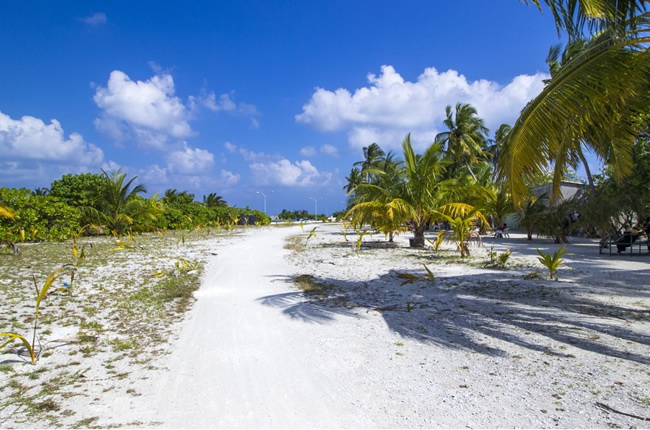 Wide white sands, the beach facing to the south you will enjoy: clean, beautiful, and almost "across the road." Called "Sunset Beach", on the shore expect about 20 sun loungers, which are not always occupied and you can set them either in the shade of the luscious green vegetation or in the sun, and nothing on the horizon can obscure turquoise water's stunning views. This beach has another and very significant benefit: it is very convenient and safe to swim, both for children and adults. A beautiful small lagoon, a good entrance to crystal clear water. The beach is cleaned daily. If you like snorkeling - Bodufolhudhoo has one of the best house reefs in the Maldives. Safe with plenty to see, the reef is less than 100 meters from the beach - so you will need very little effort to enjoy the beautiful coral and fish life. The current is weak and you can easily swim against it while enjoying a vibrant marine life below. Expect large schools os fish, eagle rays, octopuses, as well as impressive schools of angelfish, parrots and of course pelagics, including whitetip and gray sharks, rays and turtles. Snorkeling gear is rented in guest houses, but it is better to bring your own. 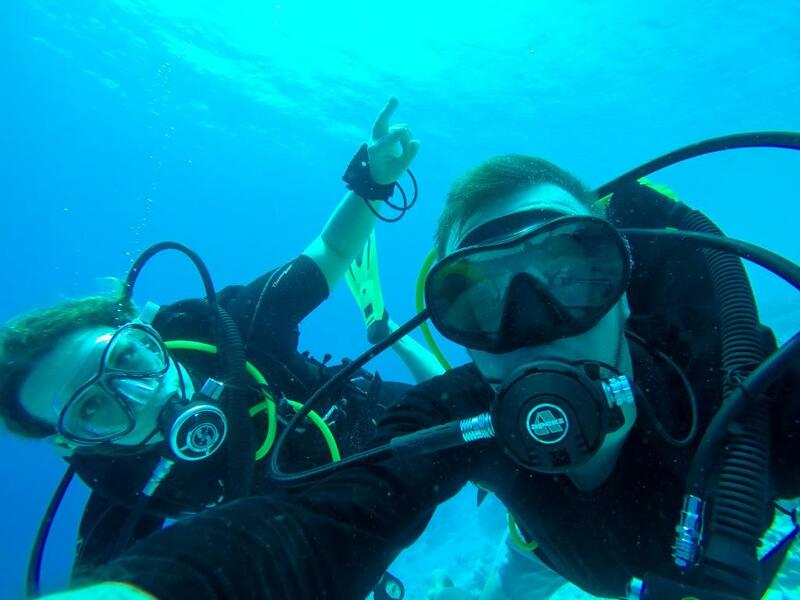 Scuba diving is always so much fun! Atoll Scuba is a professional dive center PADI on Bodufolhudhoo island dedicated to learning diving and exploring Maldives' marine life. A young and dynamic team of diving instructors, marine biologists and operators demonstrated their experience and professionalism working with the government and various organizations and researching underwater objects. Atoll Scuba focuses on providing high-quality, safe and fun diving. Beginner or master, you can expect the best diving in your life in the Maldives! It is worth to book a day trip to the nearby uninhabited Mathiveri Finolhu island in five minutes by boat from Bodufolhudhoo. A great place with clean white sands to spend the next two hours enjoying the desert island. 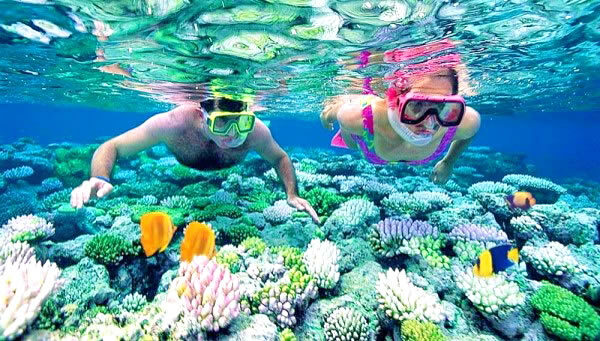 It is also worth trying snorkeling to see the rays and spots of a healthy coral in shallow water. Pink and blue-tipped varieties, prickly as a fern, sit next to varieties with thick long stems, like the pipes of a church organ. 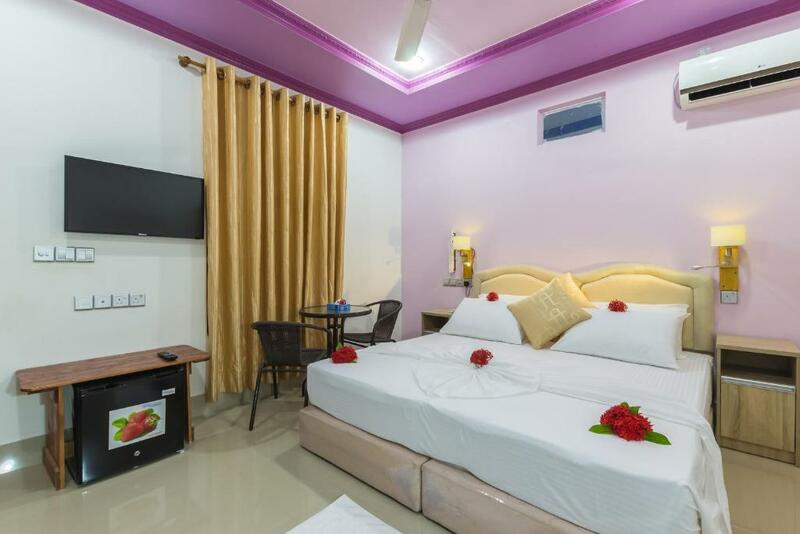 Also in the vicinity of Bodufolhudhoo is Nika Island Resort & Spa, Gangehi Island Resort and Velidhoo Island Resort where you can organize a half-day or full-day excursion, visit a restaurant or relax in the bar. Other popular activities include night fishing, deep sea fishing, spa, barbecue picnic on an uninhabited island, dolphin watching, island hopping, motorized and non-motorized water sports, and also snorkeling with whale sharks. Maldives is one of the top five destinations for watching dolphines & whales, Maldives accomodates varied species of dolphins and Whales. Dolphin species found in Maldives include bottle nosed and spinner dolphins, while the whale species include blue whale and sperm whale. 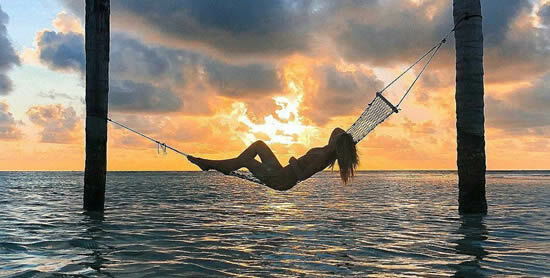 Most of the resorts in Maldives offer Dolphin & Whale Watching as an excursion during the season. And if you get into the season for a manta rays - then definitely take an excursion, and not one! Next to the island is their cleaning and feeding station. Also you will be able to wander around the beautiful island of Bodufolhudhoo and experience the peaceful serene life that the locals are enjoying. The close knitted community are both friendly and ready to make you feel safe and welcoming on the island. Food and service in Bodufolhudhoo at the highest level! In addition to buffet and à La carte meals in the guest houses, the island has two local cafes a small tea shop, and some guests prefer to order food there. They are simple but fresh and delicious. Often guests, on their first night love to eat in the cafe to enjoy the sea breeze. 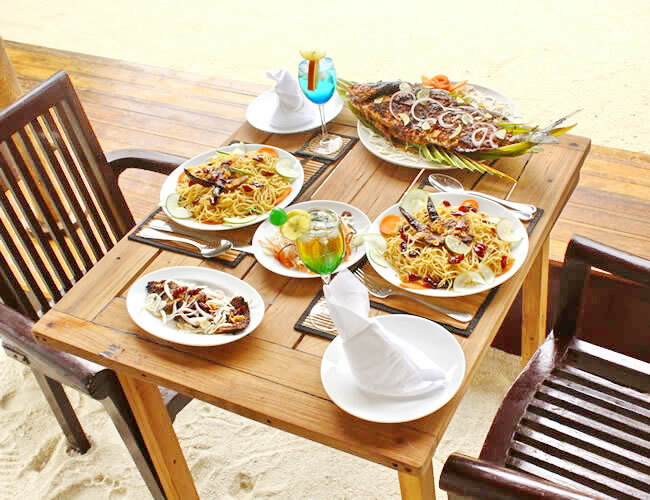 Expect on the table a fried reef fish, vegetable curry, fried rice and Maldivian salad of dark green leaves. Served in generous portions the food is not only delicious but also beautifully presented. On the way to your hotel you can visit a local shop and buy ice cream. 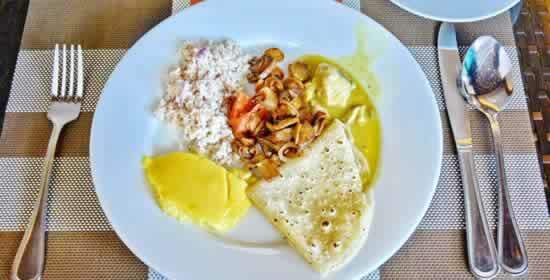 Breakfasts include Mas-Huni (tuna with coconut, onion and chili - amazing), coconut chapatti, eggs and sausages. Drinks include coffee and fruit juices. Drinking water is available in the room, and is served at breakfast and dinner for free (1.5 liters). If you have a special occasion, the hosts can prepare an incredible barbecue dinner. Imagine an outside space decorated with palm branches, lights and flowers, and delicious treats from mouth-watering grilled fish, chicken, pasta, along with fried rice, salad and roshi (a very delicate local chapati). The fish is marinated according to a special recipe using lime, pepper and coconut. "About the fact that the island has no seafood.... in addition to fresh fish, almost every day ordered shrimp on the grill, lobster on request, too, please, plus the guys were treated to fresh octopus".